Chicago Bears Next Preseason Game Thursday Night On GLO! [VIDEO] View Schedule. The Chicago Bears are hoping to climb out of last place with a renewed emphasis on offense, heading in the 2018 season. New head coach Matt Nagy comes over to Chicago after being the offensive coordinator for Kansas City. Former Oregon head coach Mark Helfrich takes over as the Bears new offensive coordinator. 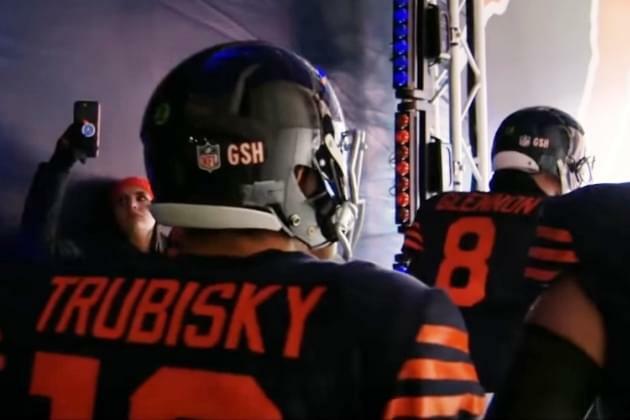 They’ve given some new tools, plays and outlook to second-year quarterback Mitch Trubisky, whom they hope will be the franchise quarterback Bears fans have longed for. Last year, Trubisky, taken #2 overall in the 2017 NFL draft, was a rookie starter and game manager. He managed just 7 touchdown passes against 7 interceptions. The Bears limped through the season as the worst passing team in the league last year. This year, the coaching staff is giving Trubisky as “touchdown to checkdown” mandate to be more aggressive. We’ll see if it translates to on field success. The Bears defense should be solid again, and the team, overall, is one of the NFL’s younger teams which is promising. The Bears will have plenty of room for improvement. They’ve missed the playoffs seven straight years and finished in last place the last three. Here’s to a big turnaround season this year. Hear every snap of every game on your home for classic rock and Chicago Bears football, 95.5, GLO.